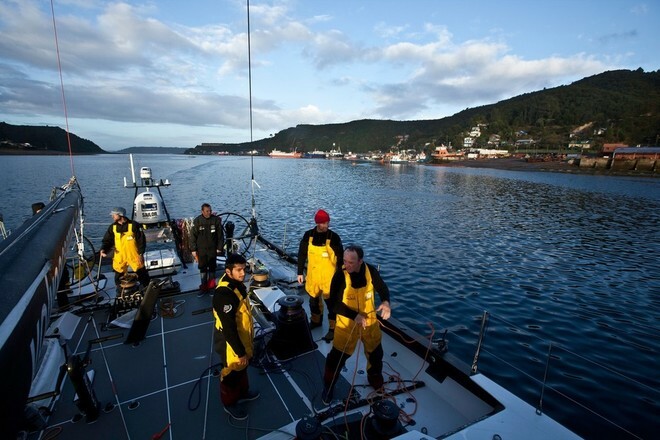 In the Volvo Ocean Race, whilst the Camper crew are battling through the South Atlantic towards Itajai, Abu Dhabi Ocean Racing’s Azzam is also making her way – on a transport ship – towards southern Brazil while two members of her shore crew work flat out on repairs. 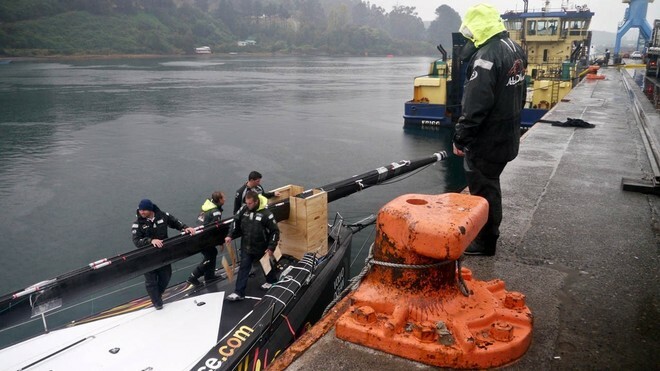 Ian Walker’s boat suffered considerable bow damage and was forced to pull out of Leg 5 – as did Team Sanya before them – before making their way to Puerto Montt in Chile to pack her on a cargo ship for transporting to Brazil. Azzam was safely loaded on to the deck of the MV Thorco Empire last week and secured for the 2800-nautical mile passage to Itajai. Some unforeseen local regulations caused a bit of a delay to our sailing time and we spent the first night at anchor off Puerto Montt. Tim (Collen), myself and some of the ship’s crew continued to secure the yacht and by morning our clearance to sail was confirmed. Early fog had cleared to leave a warm and calm day as we weighed anchor at 1100 and made our way down the Golfo de Ancud, sunshine reflecting off the snow-capped volcanoes. Abu Dhabi Ocean Racing, skippered by Ian Walker from the UK, arrives in Puerto Montt, Chile, during leg 5 of the Volvo Ocean Race 2011-12, where their Volvo Open 70 yacht ’Azzam’ will be shipped to Itajai, Brazil. Our guides for the passage down to the Atlantic entrance of the Magellan Strait had planned a route that would take us through a number of the more sheltered coastal passages and shield us from the worst of the South Pacific weather. After a spectacular sunset, we entered the first of these channels from the Golfo de Corcovado and were rewarded with calm seas and good speed of 15 knots. Rolling through 40 degrees made life ‘interesting’ onboard. Simple tasks like walking along a corridor were turned into an exercise in agility, while chasing your food around the table while your seat slides around the floor brought comedy moments galore! We passed from the Golfo Penas into the next channel through a lethal looking collection of rocks, the pilot calmly issuing new headings. Suddenly it was calm again! A pod of whales and some albatross were sighted in our last stretch of the open Pacific. Some amazingly narrow passages greeted us in the morning (one as narrow as 200 metres!) along with views of mountains and icy-blue glaciers. Since it was so calm, Tim and I set to work on the yacht; we have a big job list and need to make good progress before arrival in Itajai so we can focus on the major repair. Today (Sunday) was the day to rebuild the forward stacking bay that was sacrificed to shore-up the damaged hull. Tubes were cut, splinted, fitted and glued together to form the frame, ready to laminate tomorrow. It was pretty cold in the boat, around 10 degrees, so slow cure time meant that was the end of play for the day on that project. Next up was repairing the bracket for the keel hydraulic pump, a victim of the violent motion of a Volvo Open 70 at high speed. Some extreme deep-south laminating skills were called for and Tim Collen duly delivered! A special sight today was an wrecked ship perched high on a reef after a serious pilotage error back in the 70s, a reminder how treacherous these waters can be. What is also remarkable is that since leaving Puerto Montt, we have only seen a handful of boats and almost no sign of human life other than the light beacons guiding the way through this utterly unforgiving landscape of ice carved barren rock. The Strait of Magellan will take us down to 54 degrees south, around the southernmost point on the South American mainland, Cape Froward. Not quite Cape Horn, but a significant turning point none the less. Then we enter the Atlantic and start the long route north to Itajai. The ship is making all speed however we can’t get there soon enough. I am sure the rest of the shore team are just itching to get their hands on Azzam and get her ready for the next leg to Miami.